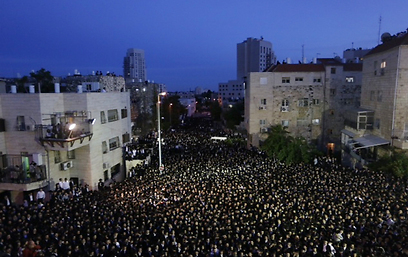 Some 30,000 haredim held a protest vigil in Jerusalem Thursday. The rally, held in protest of haredi enlistment to the IDF and civil service, quickly turned violent, resulting in the injuries of six officers and five protesters. Eight protesters were arrested. The protest was held at the initiative of the most radical of haredi factions – the Eda Hahredit – against what they dub the "enlistment edicts," currently threatening yeshiva students. They were joined by a number of more mainstream haredi rabbis. On the other side of the street a small number of haredi soldiers were holding a counter protest against draft dodging. Equal share of burden within 49 days? Through megaphones and leaflets, the protest's organizers called on protesters to refrain from provocation, but clashes between protesters and police, journalists and haredim in IDF uniform nonetheless ensued. There are additional reports of objects being thrown in the direction of both police forces and haredim currently serving in the IDF. Pini Rosenberg, the protest's spokesperson, said that "tens of thousands are taking part in the haredi response to the Peri Committee. We say 'no' to the enlistment of yeshiva students, even if all of us will be forced to go to jail en masse. We have survived for 2,000 years and will survive this spiritual destruction as well." Regarding the spouts of violence plaguing the protest, Rosenberg said: "It is clear to all of us that this is just a small number of protesters in comparison to the tens of thousands God fearing protesters. We have no control over the youth." Border Patrol forces are forming a 200m human barrier between the protesters and the recruitment center, and clashes are being reported in wake of stone throwing on the part of the haredim. The protest is being held under the title "Gathering of the Tens of Thousands," despite the fact that the protest's permit allowed for only 5,000. "The army is not a place for Torah students," Aryeh, a 17-year-old yeshiva student participating in the protest insisted. According to him, "what is happening here will lead all those taking part in the protest to refuse enlistment." "The few that acted violently and threw stones did so only because of police provocation; the moment they see incidents against other haredim they will never enlist, even if they intended to do so before." Tzvi, 15, another yeshiva student, also joined in the criticism of the police. "It would have been much calmer here if the police hadn't shown up at all. The stones were thrown by around 20 bored guys. Nonetheless it was blasphemous." 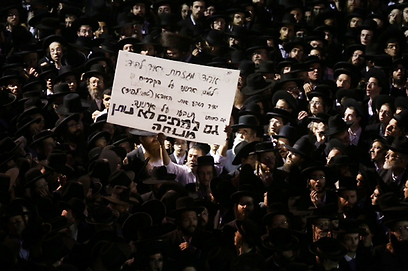 Through billboards, the haredi public was called to arrive in mass to protest against "the leaders of the government in the Holy Land," which, according to the rabbis, are prosecuting the haredi Jews "in a number of strange and peculiar ways," with the clear intent of "destroying the haredi nature and to desecrate the purity of the Torah's followers and students." The Eda Haharedit faction accuses the government of turning up the heat on anti-haredi sentiment and enacting a number of "edicts" against the haredi public. According to them, the government is attempting to "check (the community's) pulse" – "will we have the courage and prepare for war, or, god forbid, will we raise our hands and surrender?" "Remember! Your fate is in your hands!" one of the signs inviting the public to the protest read. "Your participation in the gathering of the tens of thousands is the only alternative to saving our youth from the edict of enlistment!... The government's edicts threaten the future of the people of Israel in their entirety… this is the time to be resolved and prevent these edicts!! !," others read. See all talkbacks "J'lem: 30,000 haredim protest against enlistment reform"